Luxurious, complete, solid-brass faucet set, precision manufactured by FREUER. Outstanding build-quality, finishing process, and appearance. 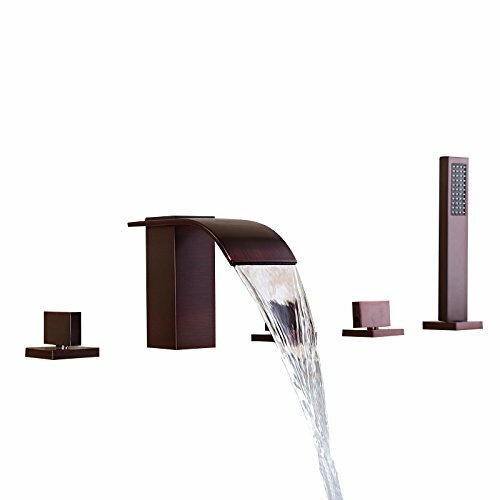 This faucet has a opening along the entire front edge of the 4" wide by 5 3/4" deep spout which creates an absolutely beautiful, waterfall effect. Handles use 1/4 turn ceramic valves for easy on/off operation. Pull-out hand-shower includes a mounting grommet and a 62" chrome hose, and can therefore be mounted near or far from the other faucet components. Faucet includes hardware to install hot & cold handles up to 20" apart, and the diverter handle up to about 16" from the spout. Includes 3/4" FIP / IPS male thread fittings (supply lines to wall not included). Sink drain sold separately. 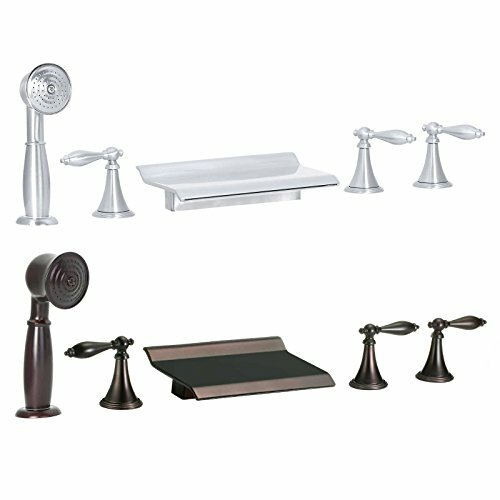 "There is nothing like upgrading your bathtub to the Two Handle Widespread Roman Tub Faucet with Hand Shower. 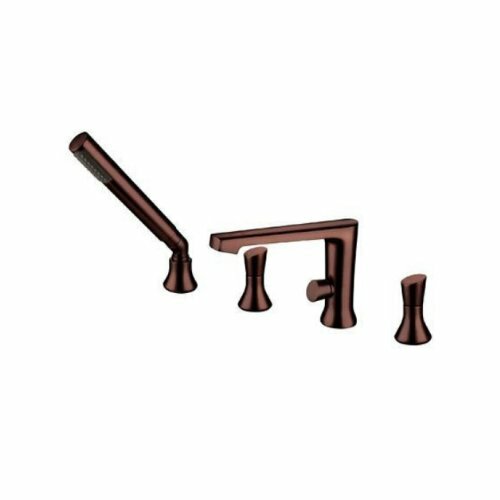 This European oil rubbed bronze roman tub faucet is both elegant and durable in its design. Its chic appearance is guaranteed to attract the attention of guests. An invitation to draw a lavish bath awaits you as the smooth lever handles and the bathtub’s natural lines call out to you. Plenty of features come with this bathtub faucet that can both enhance the tub’s functionality and the overall appearance of any bathroom. Features such as the hand shower hose, as well as hot and cold water supply hoses and mounting hardware come standard with this faucet. Further, the faucet has a 7-inch spout that looks elegant and chic. For smooth and long-lasting operation, the Roman bathtub faucet also has a solid brass construction that gives it the fantastic aesthetic appeal. There are two lever handles and a water spout for everyone to enjoy. 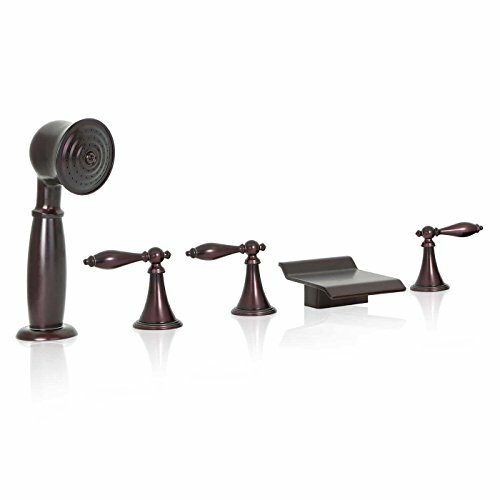 The best and most attractive feature of this bathtub faucet is its oil rubbed bronze finish. An elegant flow of water from a solid brass finished faucet like no other makes this product a must-have for your home's bathroom. 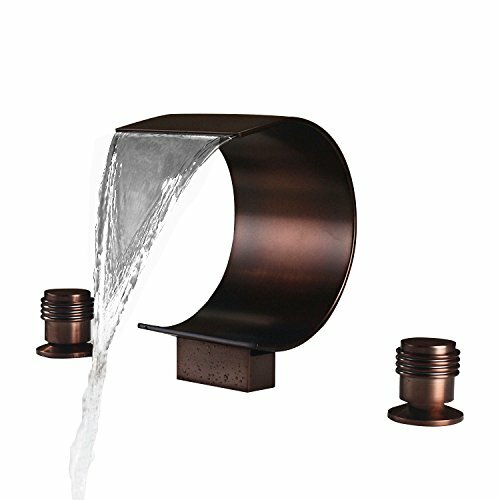 Product Type: Bathroom Faucets Feature a curved waterfall spout for a touch aesthetic appeal. 3 parts coated with ORB stand out from the crowd. Double rotatable handles with effortless control of hot and cold water. Product Information: Style: Modern Feature: Waterfall Finish: ORB Material: Solid brass Spout Material: Stainless Steel Valve Type: Ceramic Valve Included: Yes Dimensions: Faucet Centers: Not Fixed Overall Height: 8.46" / 215mm Spout Height: 6.69" / 170mm Spout Reach: 2.76" / 70mm Spout Width: 5.12" / 130mm Package: 1 x Bathroom sink faucet Hot & cold flexible hoses Necessary installation fittings Notice: Not suitable for low pressure.Minimum required water pressure is 0.05 MPa (0.5 bar). Check if all the fittings are complete before installation. If you need any help, feel free to contact us immediately. Luxurious, complete, solid-brass faucet set, precision manufactured by FREUER. Outstanding build-quality, finishing process, and appearance. This faucet has a opening along the entire front edge of the 7 3/4" wide by 5 3/4" deep spout which creates an absolutely beautiful, waterfall effect. Handles use 1/4 turn ceramic valves for easy on/off operation. Pull-out hand-shower includes a mounting grommet and a 46" nylon braid hose, and can therefore be mounted near or far from the other faucet components. 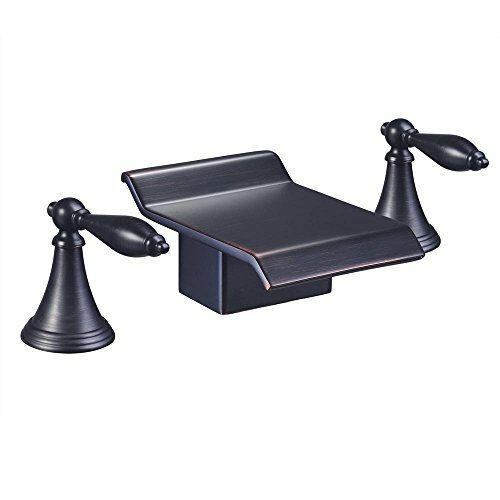 Faucet includes hardware to install hot & cold handles up to 20" apart, and the diverter handle up to about 16" from the spout. Includes 3/4" FIP / IPS male thread fittings (supply lines to wall not included). Sink drain sold separately. 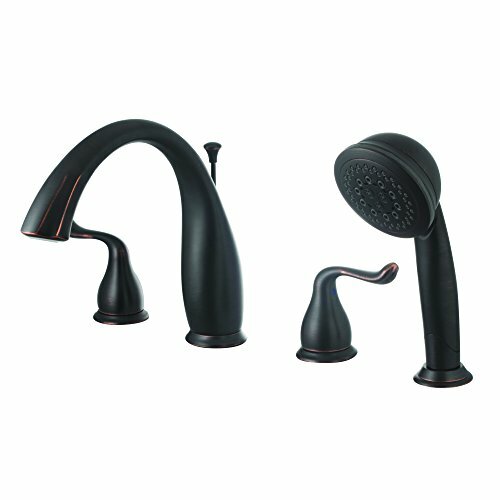 Olympia Faucets offers a quality line of faucets, valves and bath hardware at a very competitive price. All Olympia products are manufactured to specifications that meet or exceed all pertinent codes and regulations and are nationally distributed from our distribution facility located in Nashville, TN. 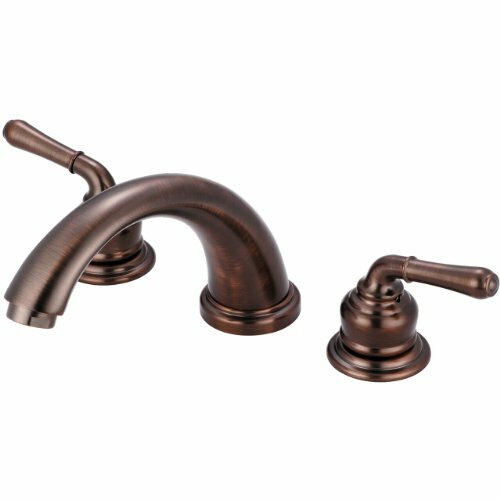 Two Handle Roman Tub Set, Metal Lever Handles, C Style Rigid Spout, 7-1/2-Inch Reach, Ceramic Disc Cartridges, 3-Hole 8-Inch to 24-Inch Installation, Roman Tub Valve Set Included, Oil Rubbed Bronze Finish. The mission of Yosemite Home Decor is to be the leading provider of innovative, high quality lighting fixtures and related home decor products to commercial, builder, and residential markets. Yosemite Home Decor has a total commitment to a Customer First attitude and to being consistently superior to competitors in fulfilling customer needs. Yosemite Home Decor is also committed to growing profitably and to create the opportunity for all employees to contribute, grow, have fun, and take pride in their work. Features: - Easy to install. - Finished in a high quality, corrosion resistant oil rubbed bronze. 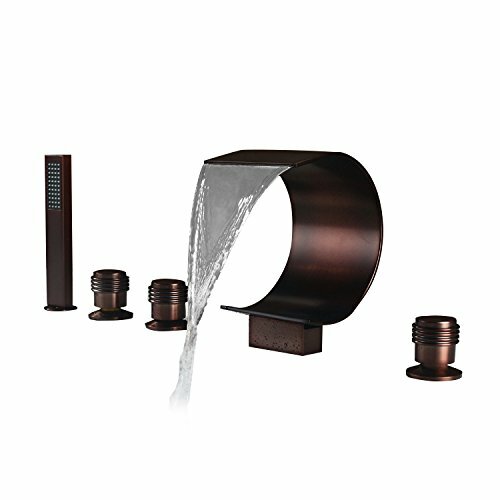 - Waterfall,Hand shower included - All mounting hardware and hot/cold waterlines are included. Specification: - Installation Type: Deck mounted - Installation Holes: 5 holes - Number of Handles: 3 Handles - Body Material: Brass - Spout Material: Stainless steel - Finish: ORB - Style: Contemporary - Valve Type: Ceramic Valve - Cold and Hot Switch: Yes - Overall Height: 8.46" / 215mm - Spout Height: 6.69" / 170mm - Spout Reach: 2.76" / 70mm - Spout Width: 5.12" / 130mm - Installation Hole Diameter: N/A - Flow Rate: Max 9 GPM / 34 LPM (tub spout); 2.5 GPM / 9.5 LPM (hand shower) - Drain Assembly Included: No-We will check all the products before sent them out to insure their high quality. Don't worry to buy. Looking for more Orb Roman Tub similar ideas? Try to explore these searches: Body Oil Lavender Harvest, Cosmetics Box, and Rolling Safety Ladder. Look at latest related video about Orb Roman Tub. Shopwizion.com is the smartest way for online shopping: compare prices of leading online shops for best deals around the web. Don't miss TOP Orb Roman Tub deals, updated daily.